Our simple project that would easily have been completed in a few months and a trip to a big box store turned into over a year of hunting and gathering, repainting, refinishing and reupholstering. 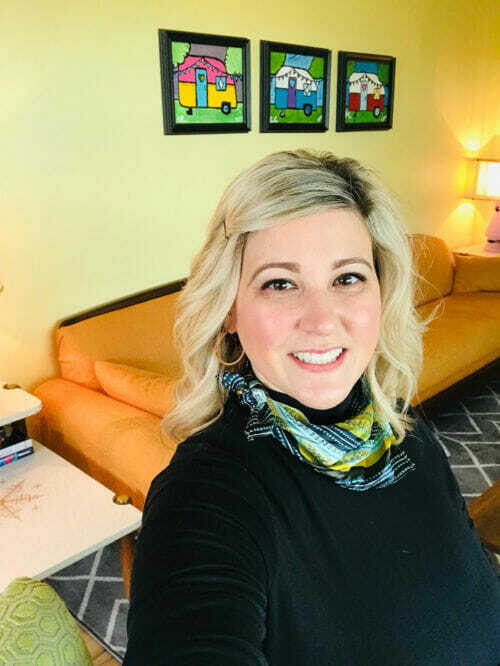 “The sofa is an Adrian Pearsall original, and what started the crazy obsession I now have😉,” Monica said. Light is made by Practical Props. Hi Pam, We added onto my grandfather’s hunting cabin to make a very special weekend home. We refer to it as the cabin. It’s less than 900sq.ft., but it lives much bigger. The kitchen is new construction. My grandpa built a little camp house, 12 x 24, it didn’t have electricity or running water. We moved it from the backside of our property to the hill where it sits now. We added an equal size room onto the front of it and another onto the backside of it. All the work from beginning to end was done by my family members. Only the bathroom tile, the cabinet paint, the sheetrock and the flooring were done by contractors. It has truly been a labor of love! The retro look started with finding an Adrian Pearsall sofa at the beginning of the project. While I was trying to gather information on the sofa I stumbled onto your blog and the rest, as they say, is history. 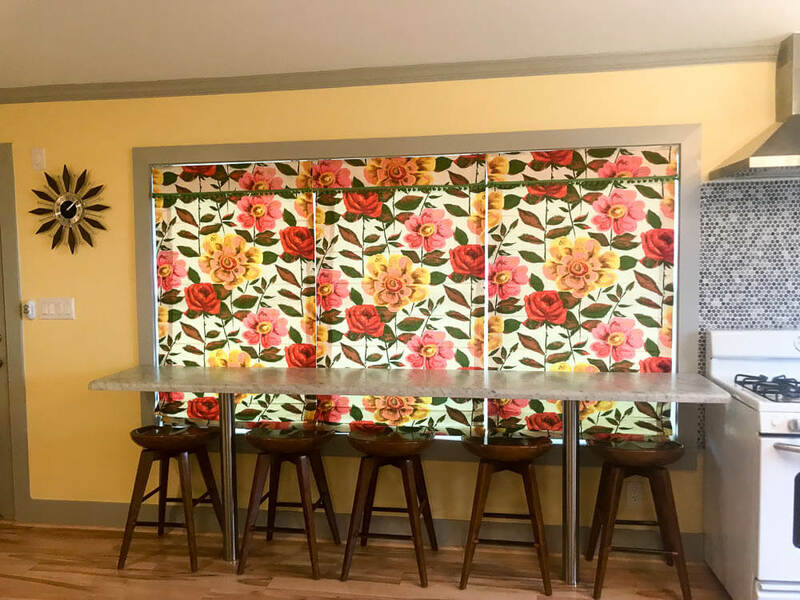 Our simple project that would easily have been completed in a few months and a trip to a big box store turned into over a year of hunting and gathering, repainting, refinishing and reupholstering. I poured over your blog, scoured e-bay, searched craigslist and basically lived on Pinterest to get the job done. 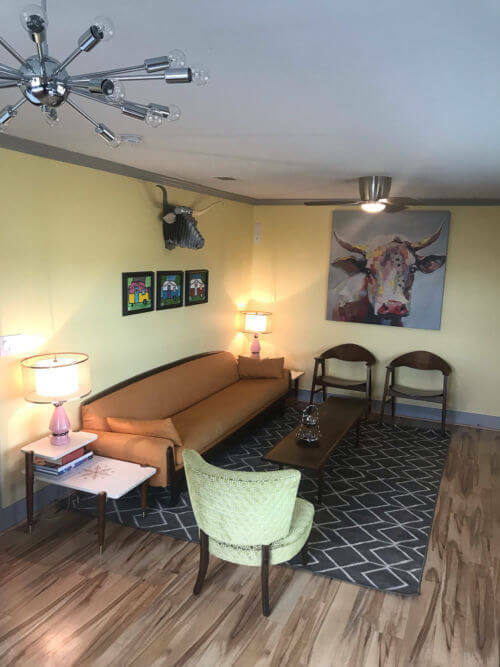 The only person who worked harder to make my dream of an honest to goodness mid century bungalow come true was my amazing husband. I love the result so much that we are in the process of designing our mid century ranch dream home right now. I already have the bathroom fixtures for all 3 and 1/2 bathrooms! Each one is a different pastel! I want to build a brand new home that could have been plucked right out of 1956. I tend to take a few liberties, everything isn’t vintage, but what isn’t definitely has a retro feel to it. 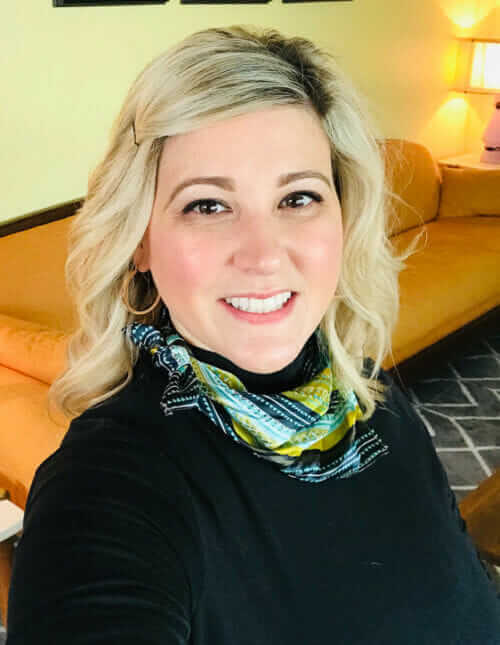 A little about me: I’m 39, married for 20 years to my high school sweetheart, have 3 kids, I homeschool, I love cooking, travel, architecture and decorating! We live on a ranch in Texas surrounded by family and friends. Life is grand! As you know doing it the hard way is a lot of work, but worth every penny and step. Thanks again for taking the time to look at my “ baby”, and thank you for your blog, without it I never would have discovered my passion for the fabulous 50’s and 60’s. Thanks for all your inspiration and your dedication to the fabulous 40s, 50s and 60s! 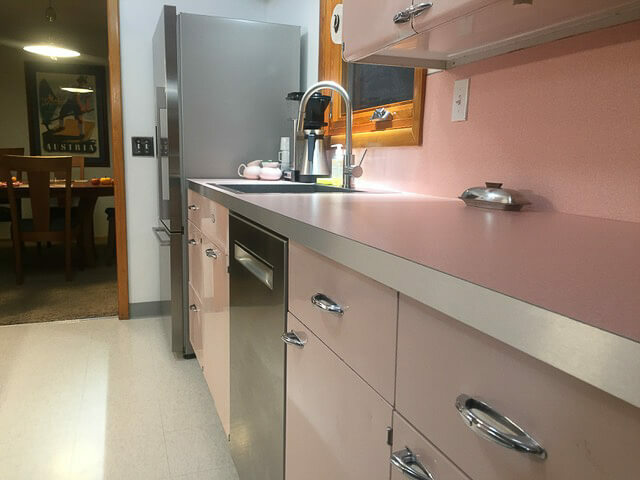 Kitchen cabinets — The kitchen and utility cabinets (shown right) are Sears and were dated 1953. I scored them off of Craigslist. We have, of course, repainted them in pink and mint. My husband and brother custom made the lower corner shelves to coordinate with the uppers. Appliances: The appliances are GE Artistry (now discontinued). Ceiling light: The atomic light in the kitchen is the 24” midround in chrome made by Practical Props. Tile backsplash: Floor and Decor Festival Dark Gray II penny round tile. (affiliate link) canisters and wall dispenser were EBay finds. The barstools and clock are not vintage, I purchased them from Amazon (see some similar designs here / affiliate link), but they have the right retro lines to fit right in! 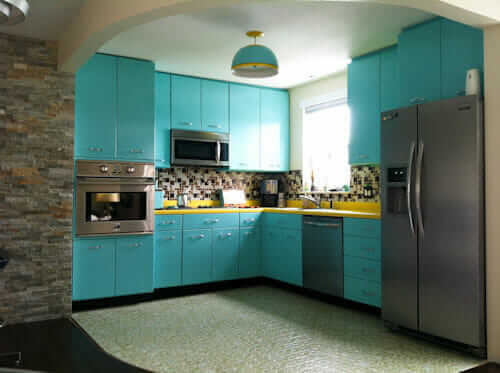 Kitchen Walls- Optimistic Yellow 6900 — Pam notes: Yellows are the most difficult colors to get right, because the color becomes distorted as its reflects and bounces off itself. This one looks like a winner! What a fun project, Monica, to get the opportunity to renovate an entire cabin. (We are going to take a look at your bathroom tomorrow.) The kitchen is just darling, and the story, just as great! 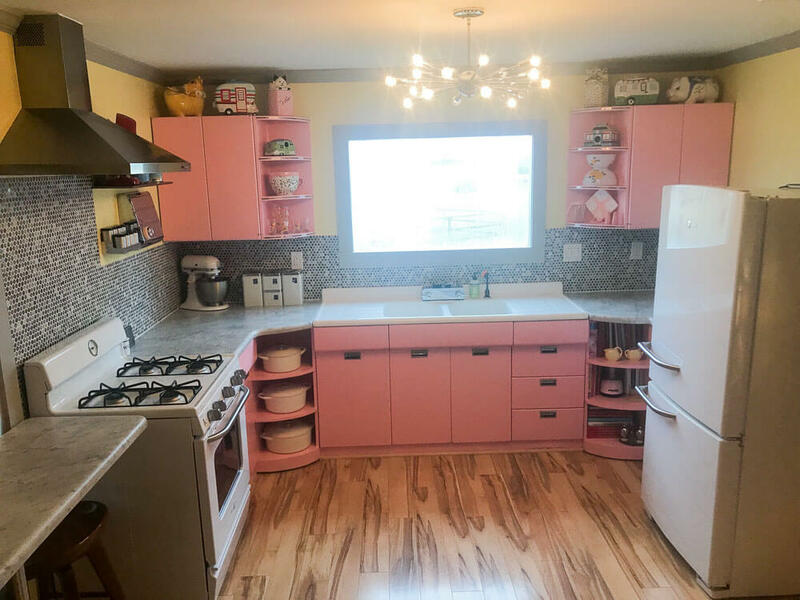 And speaking from personal experience I will add: Your children will grow up … beaming about this kitchen (and their mother and father’s adventures to create it) even if they don’t totally appreciate it now. Thanks for sharing your story, the resources, your photos, and your inspiration with all of us! 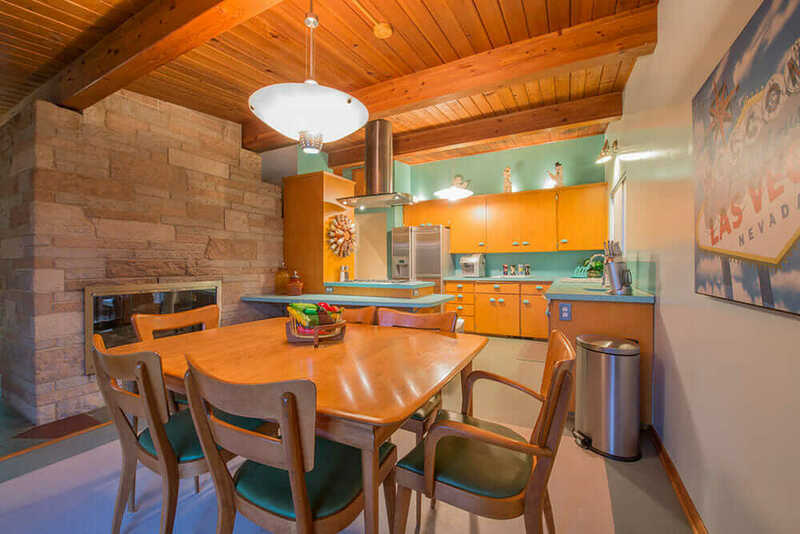 Tammy’s fabulous 1961 ranch house for sale — “The Lady is a Tramp” is hitting the road! Kara Vallow’s Bicentennial Chic kitchen: That’s what it’s all about! The backsplash was the eye catcher for me. Who knew penny round would look SO good. Which gray was it on the Merola site? Thank you, I do love how the backsplash turned out! When I was trying to track down the name and other specs for the tile I remembered that we purchased it from Floor and Decor. When I looked on their website I found that it is still available. It is listed as: Festival Dark Gray II. I might have been mistaken about it being Merola, although they have some lovely penny round sheets in many beautiful colors! I’m sorry for the mix-up. I will update the source / link in the story. Hard to believe as I read about this retro renovation using Sears cabinets, the store they came from may no longer exist in a few weeks. The bankruptcy court will decide their fate any day this week. 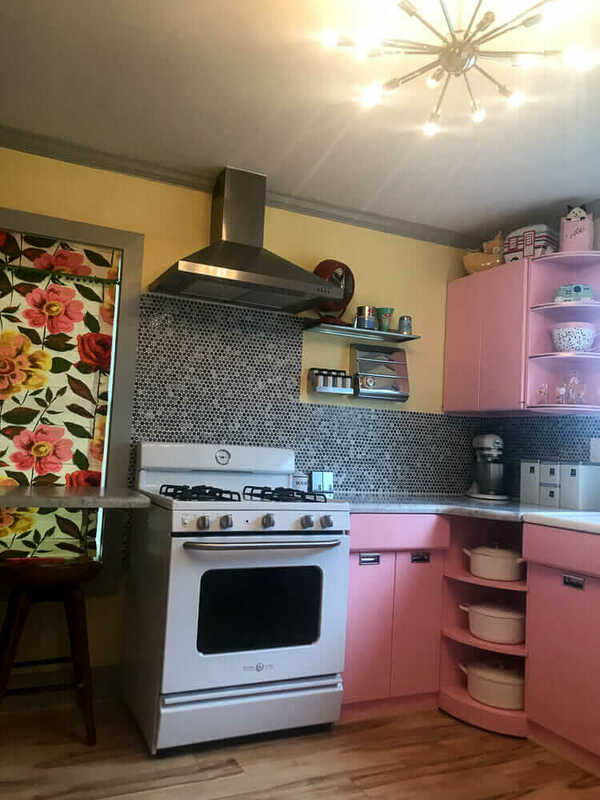 Those GE Artistry stoves and refrigerators were a nice, inexpensive way to get a reasonably retro look without the hassle of finding and restoring actual vintage appliances and dealing with their quirks (manual-defrost freezers anyone? ), not to mention potential safety issues. Too bad they were discontinued. (come to think of it, GE isn’t doing much better than Sears these days; hopefully they’ll turn things around. In any case, they already sold their appliance division to Haier). I just discovered that the GE Artstry line was discontinued. My Mother was up over Christmas and said she LOVES my appliances and wanted a refrigerator just like mine. When I researched a source for her that’s when I discovered the line had been discontinued. So, THANK YOU to Pam for highlighting this line. I purchased the entire appliance suite in black which gives the “vintage wink” in my mid-modest kitchen with 1990’s white cabinets! Besides all the other retro work you and DH did, designing and building the round corner shelves was a brilliant stroke. First, they display your vintage cookware and dishes. Second, unlike closed corner cabinets, you can see (and reach) all the way into the back of them. This way you don’t have to bribe a small child to crawl in there and get out the lemon juicer or whatever. And third, they echo the wall cabinet shelves by the window, so they are visually balanced. I repeat, brilliant! I totally agree: These rounded shelving units are brilliant! I’m just echoing everyone else- but those corner shelves are so great! 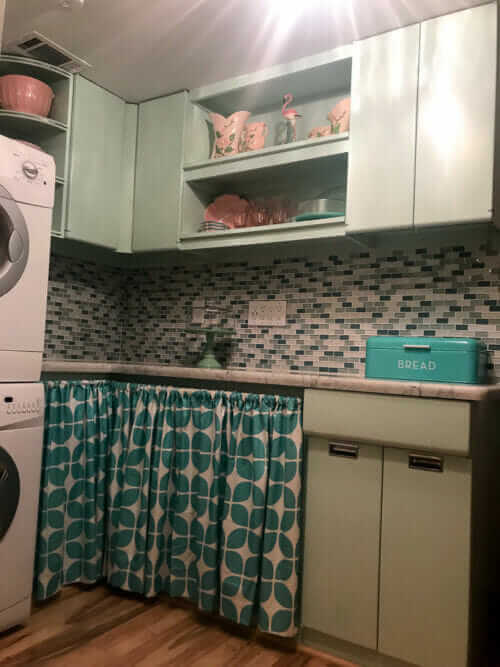 I love the pink and mint green colors on your cabinets- absolutely adorable! Also, the idea about customizing regular shades with your own fabric is genius! Wow! I’m blown away by the compliments! You are making me beam😊 Thanks bunches!! Curious about the pink and yellow kitchen color combination. I have a make shift basement bathroom in pink and yellow. I always thought it was because they used leftovers to build it. Is pink and yellow a legit retro color combination??? Why not! I think the Retro Decorating Gods would approve. The key would be to get the tones to harmonize; again: yellow the toughest color to get right. To seek out more examples of how to get these colors to work together, I’d turn to patterns, namely: Vintage wallpapers. I’m a Paint Color Consultant (with a mid-century modern home.) I happened to see the same(?) 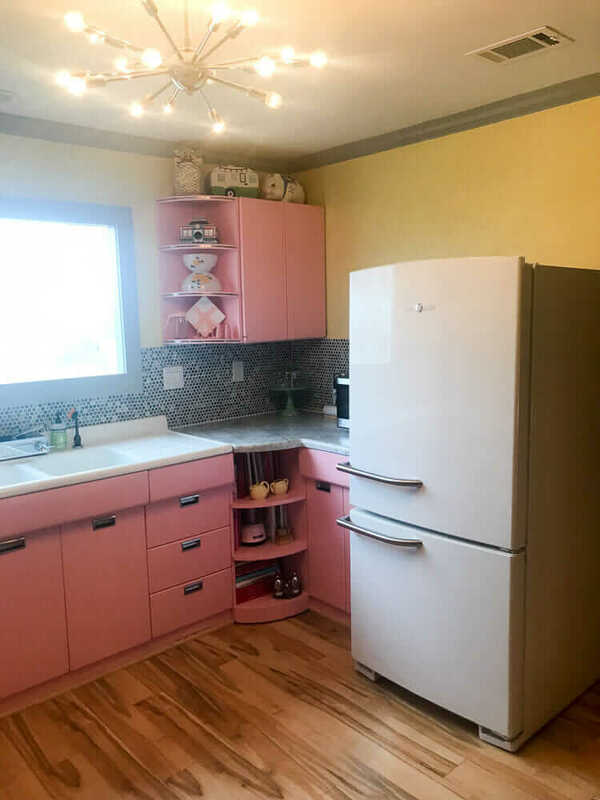 metal cabinets at a client’s home a while back and she told me she was going to replace them because an interior decorator told her they “had to go.” I protested, telling her it would be a crime to scrap them and they simply needed a retro paint job. They were in incredibly good condition and I couldn’t bear to see them replaced with run-of-the-mill wood cabinets. My client had them all repainted a robin’s egg blue at an auto body shop and they looked FABULOUS! She couldn’t have been happier that I convinced her to save them. Of all my work over the years, I think this makes me smile the most – and I wasn’t even there to consult on the kitchen! Thank you for your kind compliment. It means a lot coming from someone who is a professional!! !